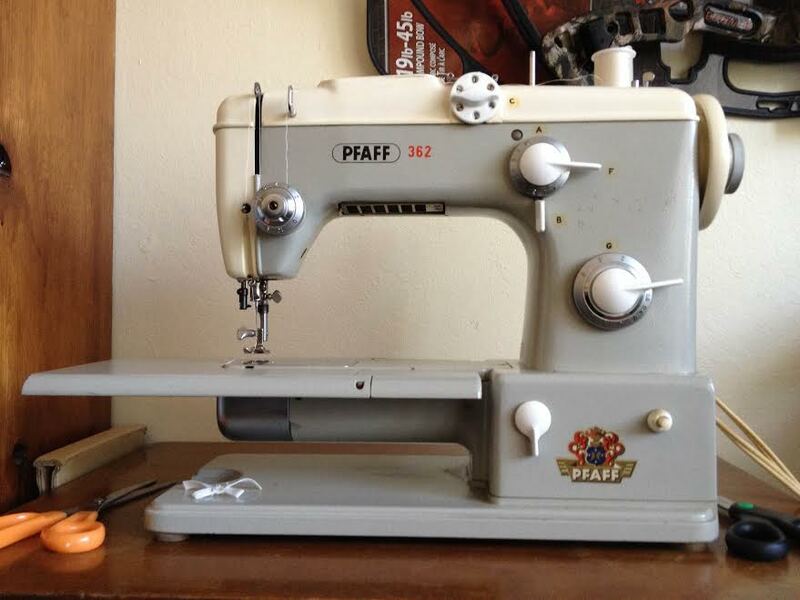 Juebejue’s Dad Buys A Vintage Sewing Machine! Oh my goodness you gals/guys, I have the most awesome dad a seamstress can ask for. One day at 9:30am I got a call from my dad. “Hey, I see this old sewing machine for sale for $20 bucks, it looks pretty good and still works, its a P-F-A-F-F 362, do you want me to buy it for you?” Just a week ago I was cleaning up my sewing room and told myself to get off the habit of collecting old sewing machines, since I rarely touch them after working on them. But this seems like just too good of a deal to pass up! That night I went to check out the new machine, and wow, I am floored by how silent and smooth it runs. It even come with the original manual and a case! The most awesome part – my dad’s as geeked out as I am about this machine 🙂 He googled about it a bunch, and found out what its really worth (lets just say, a lot more than $20!). This entry was posted on Sunday, May 18th, 2014 at 4:52 pm	and posted in hardware, juebejue's Dad sews. You can follow any responses to this entry through the RSS 2.0 feed. I have 3 vintage machines (Necchi, Singer, & Champion), but I don’t find myself using them. What do you do with yours? thats the exact reason i told myself to get off vintage machine collection. For the non-working machines, they are really cute/old looking and pretty small, so they are more for decoration. I have 2 working machines that comes in a desk, which i would like to use more often but the inconvenience of oiling and having to open the desk up always makes me change thread on my modern machine instead. however, i am trying to change up my sewing room so that i can open those machines more easily. mostly for projects that requires different threads – it is nice to have a few different machines so i dont have to keep changing threads.